I bought so much stuff on my last sojourn to Virginia, and yesterday, the box I shipped back to myself arrived on the doorstep. 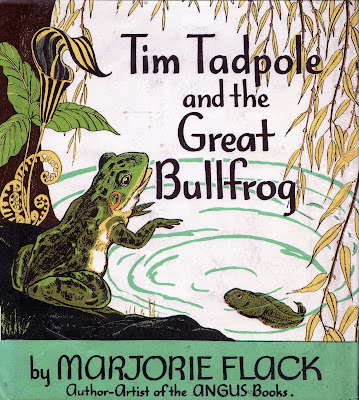 Packed full of goodies I had all but forgotten, Tim Tadpole floated to the top of required reading today. 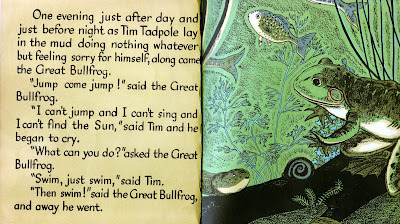 Really, educational and fun, Tim is the tale of a wee little tadpole who wants to sing and jump like other frogs, but sadly, he can only swim. His despair over his lack of legs and lungs draws advice from the Great Bullfrog to swim, swim, swim, and swim he does. So all day long Tim swam, and he swam, and all night long Tim swam and he swam and he never had time to feel sorry for himself at all. Until one day what should Tim find kicking out near his tail but two little legs! Soon came a day when Tim had a left arm and then came a day when out came a right arm! And every day Tim's tail was getting shorter and shorter and his mouth was growing wider and wider. "Now," said Tim, "I will find the Sun!" A hugely uplifting story that will get any kid who loathes being small to rise up, jump and cheer. Written and drawn by perennial favorite and illustrator of The Story About Ping and The Country Bunny... Flack's imagination is crisp and very approachable as she draws from a common place within us all. The underdog overcoming ~ which in itself is a lesson in life we hope all our children will learn. Go frog go! I had forgotten about this book, It was always one of my favorites. I like the text and the realistic illustrations. I also love the Angus books.